The story is about the much viewed (400,000 times) video on YouTube of a police officer flinging himself in a football style maneuver to knock a passing Critical Mass bicyclist off his bicycle. The video tells the truth of a story far different from the story the police officer swore to in his report of the incident. Good point and you could take it a few steps further and apply it to communities setting the record straight with respect to big city development. No longer will history be written by the ribbon-cutters if big megadevlopements succeed. NOT if they are unwilling to stick to the truth. Digital technology is comprehensively laying down the actual facts. Once upon a time, the true history of big city development was inaccessibly buried in musty old city records. Only the power brokers who wanted to tell a story with their particular slant could mobilize the resources to selectively surface the facts or non-facts that supported the tale they wanted to tell. 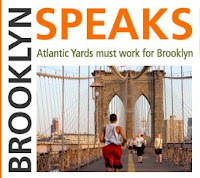 Now you know that if you want the true story about a project like Atlantic Yards you skip the official press releases and quickie news stories that feed off them and go to sources like Oder’s Atlantic Yards Report. The Atlantic Yards megaproject may be the only megadevelopment to have the trifecta-plus of Atlantic Yards Report, No Land Grab, Develop Don’t Destroy together with numerous other fine auxiliary Brooklyn community web-sites that contribute information and assessments (Gowanus Lounge, Brownstoner, etc, etc.). The relentless assiduousness of journalist Norman Oder is also a hard- to-duplicate and especially valuable asset in dealing with an off-base project like Atlantic Yards. Nevertheless, other communities like Greenwich Village opposing the Rudin/St. Vincent’s real estate density grab are well resourced and in a position to take advantage of the new technology. 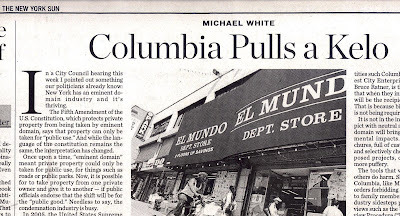 Similarly, the story needs to be kept straight by those of West Harlem opposing the Columbia University’s abuse of eminent domain and the Coney Island community fighting to commute Coney’s death sentence. Willet’s Point? The list goes on. With digital technology the actual truth is not only more readily at hand when offered up by a dedicated community, it is there in depth and better organized to tell the story. You know there will be major books written about the Atlantic Yards abuses because the abuses reach an unparalleled zenith. You also know where ALL the facts hang out and you know every Ratner-financed myth that has been examined and busted. One of our exercises in law school was to study judicial opinions for what they said and then study them afresh with reference to the facts available elsewhere they neglected to state. I was always impressed that my professors were able to dredge up the real facts for those exercises. Now those kinds of facts are just a click away. Courts that ignore them do so at their peril. The Internet also preserves. People point out how you’d better be careful about youthful indiscretions on Facebook that will follow you through an entire career. Similarly, bureaucrats whose names and slack deeds once-upon-a-time disappeared facelessly into dusty old tomes will now, instead, be enshrined forever as nogoodniks in our permanently accessible digital memories. The treatises are coming. History is being written. But it is a new kind of history. I think that the Times’ Dwyer is right when he suggests that now history belongs more to the community of individuals dedicated to the truth and less to those who might previously have had the power to vanquish them. FALLING ACORN! HOW FAR FROM THE TREE? Do you know about ACORN’s top-management cover-up of a million dollar embezzlement? The cover-up discovered just a few days ago lasted for eight years. I am figuring our local state and city government officials must now be in a tizzy evaluating what to do about the national housing and advocacy group. If you Google “ACORN” (Association of Community Organizations for Reform Now) together with “embezzlement” there are too many stories concerning the cover-up of the million dollar embezzlement by the founder’s brother for there to be time to wade through them all. As with any cover-up, the standard questions need to be trotted out for the standard basic investigative due diligence. Who knew what, and when did they know it? Who needs to be asking those questions? Any government agency that has been doing business with ACORN, is currently doing business with ACORN, or may have planned to do business with ACORN. In New York, we’ve definitely got some of those agencies. And in New York, there is another set of impinging questions that must, perforce, be examined concerning ACORN and the proposed $4.4 billion Atlantic Yards megadevelopment which ACORN has complicitly helped design as a subsidy sponge. A bunch of New York State agencies are going to have to ask these questions and the rest of us in the broader New York community are going to be wanting answers too. Who “negotiated” the CBA & MOU? The Atlantic Yards megadevelopment got rolling in large part due to a “Community Benefits Agreement” (“CBA”) and memorandum of understanding (“MOU”) between ACORN and the developer of the project, Forest City Ratner. The MOU, which was signed first, was signed on May 17, 2005. Note that May 17, 2005 was during the period of the cover-up that began eight years ago. Since the MOU and CBA were “negotiated” during the cover-up, the second set of questions that will have to be asked and answered is who at ACORN was involved in negotiating the MOU and CBA? You need to find out not only who knew about the embezzlement and when they knew about it; you also want to know if any of those same people were in any way involved in negotiating the MOU and CBA. If they were, there are problems, as I will explain. The cover-up of the embezzlement puts the suspicious weaknesses of the agreement in another light. Where Does the Cloud Fall? I think that Norman Oder’s July 18, 2008 piece does a good job pointing out that there seem to be problems with the ACORN culture. Those problems are exemplified by their abysmal record on Atlantic Yards, and other conduct by the New York office raises similar questions. Those problems with ACORN culture may also concurrently account for ACORN’s Atlantic Yards debacle and the embezzlement cover-up even if the “who-knew-what-and-when” questions can be answered in a way that 1.) absolves New York ACORN from any participation in the cover-up, and 2.) allows it to be concluded that those involved in the cover-up did not influence the CBA or MOU. To be fair, one reason Googling ACORN+embezzlment gets so many hits is because the Internet is stoked with so many right-wing attacks on ACORN. The right-wing reactions to ACORN and nearly all its activities are unpleasantly rabid. The right wing doesn’t believe in ACORN’s politics and strongly objects when ACORN pulls down government subsidies that are perceived to fund its operations and those politics. Let’s face it, if your politics are left-wing you might get just as excited when right-wing groups pull down government largess (faith-based initiative subsidies?) to fund their operations. (Some of us prefer the instinct to go lean and use subsidies as infrequently as possible as subsidies can be so readily misused.) Listening through what can be a substantial amount of shrillness, however, I think there is complaint that ACORN is engaged in extortionist tactics and is sometimes funded by “protection” payments for consultant services that institutions like banks might not really be eager to pay except for threats aimed at them. ACORN pursues minimum wage legislation which comports with its efforts to get out the votes of lower-income voters. Accordingly, one of ACORN’s critics is the Employment Policies Institute which works against raising minimum wages (arguing it is for the benefit of low-wage workers trying to enter the workforce.) The Employment Policies Institute is the source of a critical July 2006 report about ACORN cited in a Reuter’s story. The report “Rotten ACORN, America's Bad Seed” goes way beyond minimum wage issues For instance, the report gets into the relationship between ACORN and the federal Community Reinvestment Act. The report even mentions Atlantic Yards. Interestingly, what we do to address the current Fannie Mae and Freddie Mac difficulties could be affected by ACORN’s interest in setting up a National Trust Fund from which it could benefit. This is not easy stuff to sort out. Usurp the Role of Political Player and Ignore the Community? There is criticism of ACORN from other sources such as the Wall Street Journal, whose reporting is generally considered more reliable. I’ll take a pass on evaluating whether the most viciously leveled attacks of the right wing have a foundation of truth worth considering. I don’t think that government agencies who have already been doing business with ACORN while aware of such accusations are about to take them more seriously now. Nonetheless, a much broader range of people make accusations about ACORN which may be considered to have something in common with right-wing complaints. ACORN is accused of hypocrisy and insincerity. ACORN is accused of lip service respecting community goals while putting their own interests first. Norman Oder’s July 18, 2008 story details an incident respecting the proposed displacement of half the baseball, soccer and football fields on the Parade Grounds below Prospect Park for a “temporary”minor league baseball stadium. His account indicates that, beyond Atlantic Yards, there are problems with the culture of ACORN’s New York office. ACORN seems interested in pushing itself forward to claim, to the exclusion of others, the mantle of key political player, irrespective of ultimate community benefit. Reading the CBA and MOU my suspicions, just based on the documents, were exactly this: That ACORN valued promoting itself as a political player above the interests of the community. I was not considering anyone else’s accusations to this effect. News of the embezzlement and cover-up had not broken. You can read my Saturday, June 28, 2008 post (originally posted as a comment on Atlantic Yards Reports on June 20, 2008). News of the covered-up embezzlement now puts ACORN’s propensity to put its self-interest first in a pronounced new light. Consider this: State, city and federal agencies do background checks before they will provide housing subsidies. An embezzlement such as occurred at ACORN could certainly disqualify a group like ACORN from subsidy funding. (As noted, ACORN certainly gets such subsidy funding.) At the very least it must needs be a matter of significant concern to public agencies. It is the kind of thing they must bring to the attention of their upper-echelon decision-makers and their board members if they have a board. A covered-up embezzlement is actually worse than the embezzlement itself when and if discovered. The fact that the money has not been repaid and that the perpetrators of the problem and those closely associated with them have remained at ACORN and in positions of power would make it worse still. The New York Times reported that while the embezzlement was covered up, Wade Rathke’s brother Dale Rathke (the embezzler) remained on ACORN’s payroll. The Times reported that Dale Rathke was paid about $38,000 a year but that none of that money was used to pay back ACORN. The Times reported that of the $948,607.50 embezzled eight years ago, the family repaid $210,000, starting in 2001, in exchange for confidentiality. For the Times story see: “Funds Misappropriated at 2 Nonprofit Groups” By Stephanie Strom Published: July 9, 2008. A For-Sale Housing Provision - Silly or Suspicious? The provision takes on new implications when you consider the embezzlement ACORN was concealing when they negotiated the provision. If you will bear with me, I will show what ACORN might have been finagling for itself under the shadow of the cover-up. ACORN was at the time participating in programs from which they would likely have been disqualified if the embezzlement had come to light. For instance, the home-ownership programs run by the New York City Housing Partnership for the New York City Department of Housing Preservation and Development which involves money from a number of sources. The programs that ACORN was participating in and from which it could have been disqualified are exactly the same kind of programs described in the CBA for providing the benefit of additional for-sale owner-occupied units off site. Who Knew the Benefits the CBA Provided Benefit to . . .? 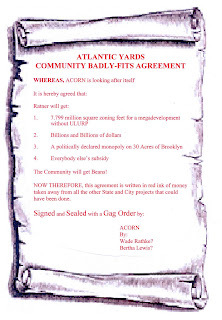 If the additional off-site units were ever going to be provided as additional benefit negotiated as a result of Atlantic Yards, ACORN was setting themselves up via the “contract” of the CBA to be involved as conduit in the providing of those units even though ACORN quite likely would be disqualified as such a conduit if the embezzlement came to light. Before anyone ever knew about the embezzlement, one must ask whether it was fair for ACORN to sell out the interests of the community in the multitude of ways that they did.- I asked that question in my June 28, 2008 post (originally a June 20, 2008 AYR comment: “As groups lobby against tax-exempt bonds for sports facilities, is WFP hamstrung by ACORN's AY deal?”). That said, once one knows about the embezzlement it seems more unfair and even more questions must be asked. ACORN got involved in promoting humongous density of 7.799 million square zoning feet for the megaproject without ULURP and with a huge diversion of housing subsidies on a no-bid basis to a single developer. It made little sense but there was something no one knew at the time because no one knew about the embezzlement. Since one knew about the embezzlement what no one could consider at the time was that ACORN was taking back for itself in the CBA agreement a form of job or subsidy insurance whereby they would indirectly attempt to require state and city agencies to continue to give them subsidy that they stood to loose because of the embezzlement. That meant the “Community Benefit Agreement” was for ACORN’s benefit. If the embezzlement and cover-up had come to light at any time State and City Agencies were making decisions about Atlantic Yards, they would have found this quite a dilemma when confronted with it. The many politicians who used the ACORN agreement as political cover when allowing Atlantic Yards to move forward should experience a similar level of discomfort. Upon discovery of an embezzlement and cover-up, the housing agencies would have an instinct to disqualify ACORN from subsidy or minimize to a carefully monitored trial amount the subsidy ACORN could receive. But with the Atlantic Yards “agreements’ in place, doing so would be scuttling the “community benefit” that was theoretically negotiated for a project of unprecedented size. They would almost feel blackmailed to continue giving subsidy to ACORN. And if the agencies continued with ACORN this would act as a blessing and precedent for others to follow! Did ACORN know exactly what they were doing in this regard and perhaps think it shrewd? Were they so desperate for a provision that would guarantee them program participation and subsidy that they would do what they shouldn’t? Was their desperation for such a provision the reason they negotiated a provision that was so meaningless and unenforceable? We don’t know. The government agencies don’t know but will have to find out. All the articles in the press and on the Internet will have to be combed through and analyzed. The agencies will have to write letters of inquiry to ACORN and seek assurances that the information in the responses they receive is accurate. They will have to consider what extra degree of due diligence is appropriate to assure that later-surfacing facts do not embarrass them. Among other things they will need to evaluate the extent to which the terms of the MOU and CBA might have been conceived as clever “blackmail” ensuring program participation for ACORN. Then all this information and correspondence forth and back will have to be accurately summarized and presented to the higher-echelon decision-makers. They wouldn’t want, like Wade Rathke, to keep the information from board members. After they explain all this to their members and decision-makers, they can account to us as the public. We’ll be waiting. No matter what, there will be a lot of work that will need to be done by the New York government agencies. I can’t make it go away but I can make one suggestion that will somewhat simplify the work of our public officials. That is to realize, as lawyers say, that you don’t have to look beyond the “four corners of” the MOU and CBA to realize that they are flawed agreements that were not negotiated to the community’s benefit and should therefore be disregarded and not given effect. Hey! Want to know a substantial simplification that would greatly simplify everybody’s life? Government officials, including mayoral hopefuls like Representative Anthony Weiner and City Council Speaker Christine Quinn, should recognize that Atlantic Yards in its entirety is an abominable mistake and it will serve the public to stop it dead in it tracks. I would like to see more focus on highway sound and noise abatement measures. I am thinking about this primarily in terms of New York City's extensive reclamation of the city waterfront for parkland. There has been a huge amount of new parkland becoming part of our lives. While pictures don't tell the story in this case, never has there been so much park land added to the city with such a high level of background noise. The Battery Park City Promenade, in contradistinction to the Brooklyn Heights Promenade, is one of the few places one can go for quite- where you might even hear water lapping the shore. The new Brooklyn Bridge Park has given some attention to what can be done about highway noise abatement but it is an example of a premier world class park with heavy public investment where highway noise from the BQE will be a prevalent factor notwithstanding. The portions of the Park that are already open are also quite affected by highway (and elevated train) noise from the Brooklyn and Manhattan Bridges. Thankfully, the noise from the Brooklyn Bridge was substantially lowered years ago when a smooth road surface replaced the open metal grid surface on which cars used to travel when crossing the Bridge. One way to sometimes escape the high noise volume in the new river parks is to go out to the end of park piers when they are available. Cars are generally the greatest contributor of noise to the urban environment. The level of sound increases substantially when roadway traffic moves at high speed. Highway congestion temporarily abates noise. Rail is usually quieter except when elevated. On the West Side, again in the riverside parks, helicopters contribute very substantial noise in certain spots since they are, not only loud, but right at the water’s edge rather than landing out on piers. Sound also behaves in ways that sometimes might not be expected. Just outside our building where we live on Montague Street it is really very quite. If you go up to our building’s new roof deck there is substantial highway noise audible from the BQE on the other side of Atlantic Avenue, quite a few blocks away. Abating highway noise is challenging and a hard result to achieve. People are often uninformed about the science aspects of it which are also not easy to research. Nevertheless, this does not mean that results are not possible. And, there are major upcoming opportunities with, for instance, the rebuilding of the BQE cantilevering under the Brooklyn Heights promenade. More earth berms and other sound baffling measures along other areas of reclaimed waterfront would also be helpful. Speak to an engineer, but I suspect that, in some cases, berming or baffling only as far up as just above car tire levels may have a good effect. One example of how a berm can assure quite is the way that tree planted hills are used in Brooklyn’s Grand Army Plaza traffic Circle area. The Brooklyn Bridge is also an example where a difference was made by virtue of the new road surface the engineers substituted several years ago. I should add to my mention of Grand Army Plaza above that the Project for Public Spaces is proposing that the Grand Army Plaza traffic flow be redesigned and this offers opportunity for even better noise reduction efforts in this area. I was told that the City has plans to actually effect some changes in about five years. There are several places on the web site of the Project for Public Spaces where waterfalls are praised for their use in public spaces because they create “white noise” which gives a certain semblance of quietude. Creation of white noise is a worthwhile tactic to consider, but it is not the same as actually reducing noise. For instance, should you listen to an iPod in the white noise area you will still have to turn up the volume, perhaps uncomfortably, to hear it. So I suggest that we focus not only be given to “sound” urban planning in New York but also to planning for reduced sound. I am particularly interested in people who can point to the science associated with potential solutions. As a recent article in the New York Times by Charles V. Bagli, “Biggest Building Site in Manhattan Up for Auction” (published May 17, 2007) made clear, it’s been put up for debate whether preservation and use of the High Line should be continued through the Hudson Yards site that is being put out for bid. There is also the question of whether and how much affordable housing might be made part of the developer site. There are various assertions about what preservation of this section of the High Line may cost. For instance, the article reports that developers assert requirements for the High Line park OR affordable housing will increase their costs by $100 million, reducing the price they will pay for the Yards. One developer, Mr Durst, reportedly offered the estimate that the High Line preservation at the site itself would cost $100 million. Friends of the High Line have offered an estimate that preservation of the High Line in the Hudson Yards area will cost only $0.8 million, an extremely different amount. A better idea of the actual prospective cost may come from the bids themselves if, as discussed, it happens that respective bidding developers submit alternate bids, one predicated upon High Line preservation, the other not. I think the question of whether this section of the High Line should also be preserved is a no- brainer. Of course the full High Line should be preserved. 1. A significant part of the High Line’s overall impressiveness is its total length. Shortening the High Line at its northen end will be a loss for the entire High Line. It will affect the language of every major tourist guide to the City forever onward. 2. The High Line is a unique opportunity being realized to create quiet public park space. The High Line is an exception to a current trend where significant amounts of our newly created City park space are subject to a great deal of highway noise.- Conversely, most of the High Line, because of its elevation and mid-block locations and distance from major roadways, will by and large provide a quiet experience. Anything that adds to the overall High Line experience will augment this rebalancing of the equation even though most of this northern portion of the High Line will not, itself, be one of the very quiet parts of the overall quiet park. 3. The High Line is creating obvious value to the City as demonstrated by the way in which developers are excitedly and quickly flocking to develop adjacent to it. I read reporting that a study commissioned by Friends of the High Line and conducted by the consulting firm Hamilton, Rabinovitz & Alschuler estimated the High Line would add 7% to the value of residential development at the Hudson Yards. That means hundreds of million dollars extra to the Metropolitan Transportation Authority (the seller) and to the City in tax revenues if the High Line is preserved in this area. 4. This is one example of a situation where the benefit of a one-time opportunity must be measured not in immediate terms but in terms of something that, like other great parks that have been created, will shape the City a hundred or more years into the future. 5. This particular terminating portion of the High Line offers the most dramatic and closest elevated view of the Hudson River of the entire High Line and links it with another major linear park, the Hudson River Park. If anything, opportunities should be reviewed for how to optimize this hook-up. 6. The High Line’s presence in this northern area provides sorely needed amelioration of some of the flaws of the Javits Center which is likely to remain at that site. It will afford the Javits Center with an immediately adjacent connection and humanizing relationship to the rest of the City through a high-profile public amenity and social experience. It will serve to help integrate the Javits Center with the rest of the City and help deal with the way in which the Javits Center is currently an austere place, which upon exiting you immediately seek to flee. There is also perhaps some opportunity in that the westerly side of the Javits Center has elevated areas that could integrate with the elevations of the High Line. Taking the opportunity that is present, Javits visitors could exit the Center and immediately begin a leisurely stroll through some of the most interesting experiences and neighborhoods available in New York. If the opportunities are destroyed, then out-of-city visitors at the Center will be handed maps of the City and told that if they exit the Center and navigate some unfamiliar streets they can eventually hook up with this interesting experience. So more often than not they may never do it. What a waste that would be. 7. If the High Line is destroyed in this Hudson Yards area it will always be famous for what WASN’T done. In operatic terms for those of us who are fans of opera, it will be as famous as the end of Turandot, where virtually every opera aficionado knows that Puccini died in the middle of writing it so that the first time that Turandot was performed, Toscanini, as conductor, stopped, set down his baton before reaching the end of the opera, turned to the audience and said, “Here is where the master laid down his pen.” Likewise, if the High Line isn’t completed through to its end, people will stroll a truncated mile upon it and get to a point, turn to each other and say, “Here is where the High Line used to continue, could have continued, and doesn’t now.” It would be dreadful if this became a disappointing part of every tour guide’s repertoire offered to all the tourists they address to take home to their respective home country. The following, while setting forth some updated analysis, is also partly in the nature of a catch-up. 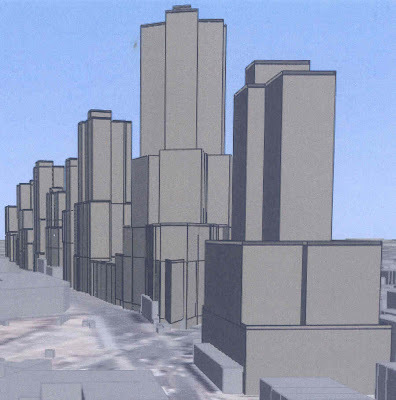 After the introductory update, this post sets forth comments I submitted to the MTA on December 10, 2007 about the development proposals for Hudson Yards. 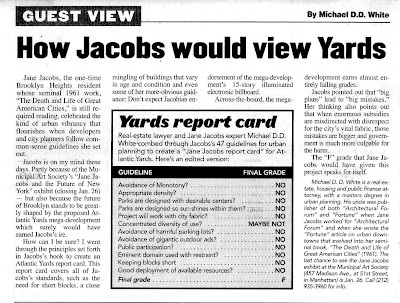 I was pleased when a month later, on January 8, 2008, the MTA received an open letter from the Hudson Yards Community Advisory Committee with comments substantially parallel to my own. The Community Advisory Committee’s open letter is available at “Open letter to the MTA from Hudson Yards Community Advisory Committee”. The PDF is available too. State Senator Thomas K. Duane. The complete membership of the Committee at that time is set forth below. My comments were with respect to five development proposals that were submitted for Hudson Yards. A proposal has now been selected by the MTA. Through a circuitous route the development proposal that was selected by the MTA was the Related Companies proposal. The Related Companies proposal was viewed by me and probably the substantial majority of the public as the second-best proposal from the standpoint of design and creation of a livable city. Brookfield Properties, which everyone thought submitted the best proposal, dropped out of the bidding. Tishman Speyer was announced as the winning proposal but did not follow through and was thereafter replaced by Related. While it is unfortunate that we are not now proceeding with the Brookfield proposal, the Related Companies design is the closest to Brookfield’s and can be modified and improved by incorporating many features of the Brookfield proposal. We sincerely hope this will happen. Density is an absolutely key consideration in evaluating the design and development proposals for the site. The Community Advisory Committee’s # 1 comment on the proposals is, “There is too much density for a successful environment.” The MTA is striving to put as much density on the site as possible in order to maximize the sales price for the yards. This striving for density is one of the things that makes attention to good design and things like continuation of the street grid and maximization of streets absolutely critical. Only with the best design can this proposed density be expected to work. Should the density for the site be as great as proposed? Very likely not. The site is a good site for high-density development but the Community Advisory Committee is probably right in complaining that too much density is being squeezed onto this site; more density is being squeezed onto the site than would be built on immediately adjacent property. If you look at what is proposed for the site in the context of what is proposed for the neighboring properties you will note that the proposed density mounds up and is greater directly over the Hudson Yards property being sold by the MTA than the property that surrounds it. That is good for the MTA because it garners a higher price but bad for the public because it doesn’t make optimal long term urban planning sense. It doesn’t make long term urban planning sense because the density around the properties closest to the extension of the #7 subway line is less although it is there that it should be relatively greater. One last thing on Atlantic Yards, vis-a-vis Hudson Yards: The participation of City Council Speaker Christine Quinn and the other above named political representatives in the Hudson Yards Community Advisory Committee letter on Hudson Yards reveals where Speaker Quinn and the others should stand on the Atlantic Yards. They no doubt know this. There are many parallels between the proposed Hudson Yards and Atlantic Yards projects so that criticisms of Hudson Yards, which is a relatively good project (a high density project in a high density neighborhood), also apply to Atlantic Yards. At the same time, all the ways in which Atlantic Yards is different from Hudson Yards make Atlantic Yards a substantially worse project, probably the worst project being proposed in the City right now. Here are the comments I submitted to the MTA in December on the development proposals for Hudson Yards. RE: West Side Yard Development Proposals: Tell us what you think. Write your comment and drop in the box. Here are my comments on the five West Side Yard development proposals. First, Brookfield Properties design is very much my favorite. Second, all of the High Line should be kept (see the final section after comments on the individual proposals). • It is the proposal with the best intricacy and the proposal with the best potential for adding additional intricacy with tweaking. That is important working at these densities. • I also like its treatment of the High Line. I think Brookfield did a superb job creating a great public promenade space around the High Line and I like to think that during much of that portion of the year when people spend the most time outside there will be an arrow of setting-sunlight coming in from the river. • It has several other admirable and varied public spaces including the best space taking advantage of the waterfront. • It does the best job of maximizing the street connections. I am in concurrence with the Curbed poll in that I think The Related Companies’ proposal is the second best in terms of its attractiveness to the public. Interestingly, the characteristics that make the Related proposal good are characteristics it has in common with the Brookfield proposal but which the Brookfield proposal mostly does better. Here are some other thoughts including some suggestions for possible eventual tweaking. Connections to the High Line. I would create more second level connections between the East/West running stretch of High Line (“West Chelsea Promenade”) and the other project public space at the South end up at that higher level. Right now there is one such connection and there should be at least one more making it easier to access the cultural space. (BTW: I note that with the Manhattan Children’s museum on the West adjoining “Hudson Green”- good idea- there are actually two cultural spaces which is good.) While some additional connections would be great, the Related proposal, by comparison, gives the High Line a sort of hug-of-death in this area and would benefit from some separations. Possible Outdoor Promenade Running East/West Parallel to High Line. There are no places I know of elsewhere where the High Line can be appreciated from its own level or from outside and above. There is a unique opportunity to create such places here with this design. In so doing, you have the chance to accentuate the sense of place and destination. Without disrupting any plans for the foundations of the proposed buildings it should be possible to create a recessed promenade that would run alongside and at the same level as the High Line. If there is recess into the buildings there would be Bellamyesque shelter from the elements that pedestrians could opt for. The promenade would also create extra connection options capable of luring pedestrians all the way to the South of the upper-level public spaces. Elevated Space on the South Next to the High Line. I think it is worthwhile to keep in mind the extra high density of this project which is why the extra streets the Brookfield plan are especially beneficial. It also means that extra pedestrian levels can be supported. Some of the multi-level kind of outdoor park experience created by Olmstead and Vaux can be experimented with here if, alongside the High Line, a third level is created. This could be done if, there were space elevated perhaps over interesting arches. There are two almost identical square parks abutting the West Chelsea promenade. The arches and elevated space could be at the South side of at least one of these spaces. Differentiating the Two Square Parks Abutting the West Chelsea Promenade. The two almost identical square parks abutting the West Chelsea promenade have a nice organized feel when looked at as part of a big plan, but as they might be experienced by pedestrians it is likely best if they are differentiated so that they provide different on-the-ground experiences. This can be assisted by slightly varying their shape. Another way to add to the difference would be to partially encircle one of the parks with an elevated vantage which could be done by allowing the space elevated over the arch (or arches) described above to continue around the park. The actual open area of the green space would remain the same, but would feel different if the elevated vantage walks were recessed into the side of the adjoining buildings. If you look at the Related plan you will see that Related has a very nice triangular public space on the South by the High Line. Some of the unusual closure feel afforded by triangle shapes could help here. See my next comment. 1. A slight triangular feel could be given to the adjacent park now planned to be square. 2. There could be elevated space in the sunlight overlooking that small park that could be an extension of an elevated vantage walk. This might involve walking out from recessed space to the sunlit space. Building pillars could be left in place for an interesting exterior effect. 3. The new promenade running parallel to the High Line could widen and open up to a wider public space that could then lead down graciously via steps from the upper-level project spaces to the street level spaces below the promenade at the Southwestern corner. Connections Between the Street under the High Line and the Higher Ground Level of the Project’s Other Public Spaces. The “West Chelsea Promenade” could be quite an extraordinary Mecca. You have Chelsea at one end of the High Line, the Javits Center at the other, and the projects green space will draw from the center of town- The Moynihan Station and new buildings in that area. “Hudson Place” as the southern end of the new boulevard/park (Senator Schumer et. al. permitting) and the cultural space will also draw people in. There will the buses and new subways and new water taxis all ending there. Done right it will have quite a draw. Therefore as much attention as possible should be paid to the space and part of this is connecting the street below the High Line to the great spaces at the project’s own ground level. There could be a very interesting stair connection, perhaps a double staircase wrapping the corner, at the corner where the Western four residential buildings reach the cultural center at the edge of the “West Chelsea Promenade.” As a destination spot I see this as being a location for a lot of interesting retail, maybe like the areas in Rome where small vendors sell silk and leather. “Hudson Green.” I think “Hudson Green” is ideal. In talking to people about it I would emphasize its similarity in size (and other aspects) to park at the North of Battery Park City because people generally know and like that park. It is great the way it is open to the Southern and Western sun. In contrast, the Steven Holl design for Extell is oxymoronic: It makes a big thing about the angling of buildings on the South to let the sun’s light through as it travels the sky but the answer would have been not to put the tall building on the South side of the property at all. If I were to mull over any tampering with it, it might be to make it just a little less rectilinear. In Related’s plan I like the nonlinear narrowing with the slight triangular point of the big east/west running main space. I know that there is an argument that Brookfield slightly diverged from the RFP guidelines by the way in which the Hotels break up the green space while providing a needed wind break. I think this defines the public spaces in a superior way, but I am also wondering whether the criticism could be addressed somewhat by providing an interesting feeling of connection under the hotel space via a route that could be very interesting to travel. Maybe part of that route would share connection with the streets. Connections to Hudson River Park. I would make the connection between the High Line and Hudson River park a better more direct one. Right now, “Hudson Green” connects with the High Line and connects via a walk way to Hudson River Park. If you want to go from the High Line to Hudson River Park you can do it by going back through “Hudson Green” but it should be possible to go more directly. “Hudson Hall” & Adjustable Outdoors. When I asked questions about “Hudson Hall” it wasn’t entirely clear whether this space was going to be more indoor or outdoor in character. But that makes me think about something I have been wondering in general. On reason I avoid and don’t enjoy Related’s Time Warner Space is that it has such a stuffy interior mall feel. Space is more fun when it is outdoors and alive with breezes. On the other hand, there are times when protection for the elements is desirable. It seems to me that with the proper mechanics there can be space that changes in character as the situation changes and that this space could be quite “green” if properly managed. In a way, it goes back to having windows that open. Looking forward, it ties in with the intelligence of computers to know what the weather is or even what the weather is going to be. People who own their own houses in the suburbs can economically cool them with central attic fans that effect a quick exchange of air with the outdoors when the temperature conditions are appropriate. Looking at the design of “Hudson Hall” I wonder about whether it could sometimes share climate with the outdoors on a nice day and other times have its own interior climate modulated largely by exchanging climate with the outside. Bring in cool evening air in the summer. Let the space be sometimes sun warmed when appropriate. I wonder whether this approach can be carried over to other public spaces in the project as well. Good Continuous Flowing Ground Floor Retail. One of the things that the Brookfield plan does very well is provide lots of continuous forking paths for a flow of ground floor retail trails. Because of the density and destination nature of the site, it should be possible to support a lot of retail. In contrast, Related’s proposal disintegrates in certain places into separated tower-in-the-park buildings that would break up that flow. Once again, there is a huge opportunity for multilevel retail tying in with the High Line. Floor Plate Sizes. I know that floor plate sizes have been discussed as a matter of importance. The Tishman proposal seems to make them important above all else. That is one reason their result is so intimidating. I gather that Doctoroff may be preoccupied with the subject in terms of New York competing with London as a financial center and the theory that there may be a continuing growth in the need for sizable trading floors (That is not necessarily my own bet). You seem to have an easy option for increasing large floor plates by increasing the height of the low structure abutting the Northwest condominium building. (The top of that space can also be a terrace overlooking “Hudson Green.”) Height could also go up for the buildings abutting “Hudson Place” immediately on the East. Integrate Space for Vintage Orchestra(s)? I would love it if you might be interested in the following. I am in contact with a vintage orchestra that is looking for a more suitable permanent home. There is another vintage orchestra with which they might conceivable share space. The orchestra is based in New York and plays fairly regularly on Prairie Home Companion. The optimal venue would probably be a nightclub style seating about 200. Building Textures. One thing that Related did well was posting pictures showing their proposed buildings with a range of various building styles and textures, a number of them reminiscent of older buildings on the West side. I think various textures and variety is a good way to go and it makes the density less intimating and everything seems more comfortably familiar. It is still possible to have big windows on the Hudson with these other styles and I think people are getting tired of glass as the perpetual answer. One thing that is interesting when you look at the Related visuals is that Related has a clump of residential buildings that look like they come straight from what we did at Battery Park City. Since they were therefore very different, they stand out oddly in the model, but the picture on the wall with different textures reconciles quite well how they would fit in. Setbacks. Given the prescribed density, there is not much opportunity for setbacks though they can add a lot to a landscape. Maybe a few things like the skewing of the first floor that I described above can add something that may help in a way, but it may just be too bad that there isn’t more opportunity in this regard. The Steven Holl design for Extell is oxymoronic: It makes a big thing about the angling of buildings on the South to let the sun’s light through as it travels the sky but the answer would have been not to put the tall building on the South side of the property at all. The cable system for construction is ingenious, but it only makes sense to use it if such a huge new section of the city can, at the same time, be well designed. This proposal does not demonstrate that this can be achieved. Jane Jacobs derided tower-in-the-park design as towers in urban “prairies.” This exemplifies that unless it is a tower in a “moor.” In this case “moor” would be less. The design does not even allow trees. There will be no way to go back and retrofit the landscaping to break up the vast center with any feel of intricacy. The buildings themselves worsen the experience by being huge, bland, featureless and repetitive. And anytime a building gets described as resembling a “tuber” you know you are in trouble. Keeping the High Line is good though. One problem with the Durst/Vornado and Extell plans is that they have too little sense of human scale. For instance, the sinuous taffy-pull shape of the Durst elevated people walkway (that “makes up” for destruction of part of the High Line) leaves you uncomfortably clueless about scale, aside from being rather silly. The proposal also lacks intricacy. The green ideas and effort is nice- but this is something that any of the proposals can be asked to do. It does not substitute for good city-making or design. The fact that the proposal does not fully preserve the High Line is a definite negative. Brookfield handles the High Line in an ideal way on 30th Street by being mostly separated from it. By contrast the Related proposal gives the High Line a sort of hug-of-death in this area and would benefit from some separations. Whereas, I would tweak the Brookfield plan to add some connections to the High Line on the South, in the case of Related's plan I would tweak it to add some separations in the same area. Keeping the High Line is good though. There are a lot of things I like about the Related proposal though I have to get over a personal blue state reaction to Fox/Murdock. I really like the triangular public space on the South. I like the nonlinear narrowing with the slight triangular point of the big east/west running main space. There is a clump of residential buildings that look like they come straight from what we did at Battery Park City. Since they were therefore very different, I had to struggle with that for a while even though I would love a whole complex done this way. The picture on the wall helped me reconcile what I thought about that. I come out positive on the tension in design. But looking at the picture made me think about some of the 12th Ave/West Street buildings further downtown that have an even older echo and it seemed to me making some of other buildings mimic that old style even more might help really pull together the conglomeration of style effect you are going for but which is not so absolutely obvious. It wouldn't be necessarily to give up big windows on the water but it might reduce construction costs. The recent changes Related made to it main model during the exhibition improve the proposal by making the Eastern buildings less like the Time Warner complex. I don’t like the Time Warner complex. I like that there is lot mixed together in the complex. I like some of the performance space there. But I generally avoid the complex. I remembered liking very much the Dan Brodsky plan that lost out to Related and thought it echoed CPW well. The idea of the waterfall of trees in the western facing windows of the tallest building. Dramatic and fun but it may be a full employment challenge for arborists which might wind up getting solved with some fairly generic easy-to-grow varieties the selection of which, accordingly, may feel a bit vintage in about 10 years. Especially as buildings near the water, the lines for linked and flowing retail is too broken. The tower in the park stuff never works out that well in actual experience. There are some ways to play with fixing this though. There is a huge opportunity for multilevel retail tying in with the High Line that is missed. Going for extra retail will be supported given the density that is coming and the potential destination aspect of the site. You have Chelsea at one end of the High Line, the Javit's Center at the other, and this is a park that will draw from the center of town- The Moynihan Station, (and new Related buildings over there), buses and new subways and new water taxis will all end there. Done right it will be a Mecca. This plan is intimidating and dull partly because too much stress is put on achieving a high proportion of large floor plate building based on a questionable bet that this is what the financial industry will be needing in the future. This is not a good bet and too high a sacrifice to make. Go back and study where Wall Street is really heading: this is a bet that probably won’t pay off. The full High Line should be kept. It may turn out that there is some arguable cost involved but I think the question of whether the northern section of the High Line should also be preserved is a no- brainer. Of course the full High Line should be preserved. 7. Any cost of preserving this section of the High Line should not be measured against the cost of demolishing it. It should instead be measured against the cost os replacing it with a fully comparable substitute amenity. Demolition for plaza or park space does not constitute a comparable amenity either in terms of area of public space or otherwise. 8. If the High Line is destroyed in this Hudson Yards area it will always be famous for what WASN’T done. In operatic terms for those of us who are fans of opera, it will be as famous as the end of Turandot, where virtually every opera aficionado knows that Puccini died in the middle of writing it so that the first time that Turandot was performed, Toscanini, as conductor, stopped, set down his baton before reaching the end of the opera, turned to the audience and said, “Here is where the master laid down his pen.” Likewise, if the High Line isn’t completed through to its end, people will stroll a truncated mile upon it and get to a point, turn to each other and say, “Here is where the High Line used to continue, could have continued, and doesn’t now.” It would be dreadful if this became a disappointing part of every tour guide’s repertoire offered to all the tourists they address to take home to their respective home country. As for High Line design: There should be no abrupt design transitions. One final comment overall. Most New Yorkers would be quite happy if this effort were not striving for this extreme density even though lower density would reduce proceeds to the MTA. But if there is going to be insistence on extreme density there must be truly excellent design to pull it off. Please feel to contact me if you want. I am a lawyer with a lot of experience in government, public finance and development and I have a degree in urban planning. At the time of the comment, the Second Circuit Court of Appeals had just upheld the dismissal of the Atlantic Yards eminent domain case. Since that time, the U.S. Supreme Court did not grant certiorari say whether the Second Circuit’s dismissal was, or was not, improper. (It was probably too soon since the 2005 Kelo case was quite recent. Though Kelo was controversial and unpopular the court considers eminent domain cases infrequently.) Of course, we consider the Second Circuit’s dismissal improper. The Supreme Court will one day grant certiorari to another analogous case and in ruling will probably make clear that the Second Circuit should not have dismissed the case. Until the Supreme Court grants certiorari to that next analogous case, the way to know what the Supreme Court thinks the Second Circuit should have done is to review what Supreme Court itself said in the Kelo case. A review to determine what the Supreme Court would think was one of the purposes of this comment. Reality denied? How can Bruce Ratner claim that the courts have dealt with the supposed “merits” of his Atlantic Yards megadevelopment since the courts have yet to deal with the facts concerning his dealings? His claim reminds us forcefully that the courts often have the luxury of doing their business in a manner divorced from reality. But before the courts can award themselves the luxury of divorcing from reality and ignoring facts they must first examine threshold facts. Given the egregious illegitimacy with which our public officials have behaved, if our courts do not overturn those actions the wrong standard of review is being applied. Justice Kennedy in his concurring opinion in the Kelo case, essential to the 5-4 decision, said that when dealing with eminent domain to effect a private-owner-to-private owner transfer “(a) court confronted with a plausible accusation of impermissible favoritism to private parties should treat the objection as a serious one and review the record to see if it has merit . .” Sandra Day O’Connor worries in her dissent that Justice Kennedy’s suggestion “that courts may divine illicit purpose by a careful review of the record and the process” may create a test ill-motivated public officials will flunk only if their intelligence level is at or below that of the "stupid staff[er]." It is in part a question of whether anything is to be presumed about the actions and motivations of public officials when eminent domain powers are stretched to take property from one private owner to give it to another. Justice Chase, quoted by Justice O’Connor in Kelo, wrote that legislative acts to force such transfer from one private owner to another are “contrary to the great first principles of the social compact, cannot be considered a rightful exercise of legislative authority” and that “(i)t is against all reason and justice, for a people to entrust a Legislature with such powers; and, therefore, it cannot be presumed that they have done it." What may be presumed has a lot to do with whether and how closely the courts will be dealing with the reality of facts. Justice Kennedy takes as a given that there should be “meaningful judicial limits on the government's power to condemn any property it likes.” In his concurring opinion he allows that there are circumstances under which the legitimacy of government action will not be presumed and also the possibility that there will be situations where the stretching of eminent domain will actually be presumed to lack legitimacy. The nation’s reaction to the Kelo decision was largely one of shock, with many thinking it went much too far. Polls showed that most Americans disagreed with it, some polls showing that the number who disagreed exceeded 90%. Reforms have been enacted in most states (but not yet in New York). Kelo may indeed have gone too far, but Justice Kennedy spoke in Kelo of drawing lines beyond which it should not be used to validate further stretches of the power of eminent domain. Public outcry has clearly demanded to know where the line is to be drawn and demand that it not be drawn to allow any additional stretching of this formidably frightening instrument of misconduct. b. “only of incidental benefit to the city." In the case of Atlantic Yards what else would one call the colossal award of building 17 enormous buildings to a single developer without competitive bids when the same work could have been bid out to multiple developers? In the case of Atlantic Yards “a particular transferee” was picked beforehand and a development plan (singular) came afterwards, generated by that particular picked transferee rather than by government officials (or traditional input from the public). In the case of Atlantic Yards, the proposed taking is not in the context of the city’s comprehensive development plans but in contravention of them. At the developer’s instigation, the Atlantic Yards condemnation footprint makes highly irregular changes to 40-year-old city plans to accomplish superfluous condemnation to generate additional excessive profits for Forest City Ratner (See the inclusion of the Ward Bakery Building block). The megadevelopment is inconsistent with the adjoining contemporaneously city-planned Atlantic Terrace project and the relatively recent abutting Atlantic Commons. As for the “serious city-wide depression”: there is no such depression either serious or city-wide and there certainly isn’t one to be found in the areas proposed to be condemned. 6. At the risk of repeating, Justice Kennedy a second time states a test that “Benefitting” the developer should not be "the primary motivation or effect of this development plan." Everyone knows that the plan, in this case generated by the developer, never even laughably withstands this test. The unspeakable sweetness of the deal the developer is being given on so many fronts underscores this point- The developer is being promised 139 years of exemption from city real estate taxes on a sports arena where the public is paying for 100% of the escalating (now at least $637.2 million) cost of a this asset, gifted to the developer as part of the no-bid deal. Hundreds of millions more government dollars exclusively benefitting Ratner have been piled onto the project in addition to this. Atlantic Yards was an example of government on the lam, hiding out and evading as much public review as possible. The megadevelopment the private developer came up with is hardly a reasonable integration with the city fabric and its incessant focus on what will benefit the developer is at the unremitting expense of public benefit. When the facts are examined, the project will certainly cause blight. The Atlantic Yard process was government on the lam, hiding out and side-stepping requirements like ULURP. What is to be made of Judge Madden’s footnote that the MTA had “stated that it had `sold’ Forest City the right to develop the Vanderbilt Yards, but retracted those statements in September 2003." There are many reasons ESDC procedures are prone to abuse. They are not used for the purposes originally intended. They have not been updated to keep pace with the ULURP reforms that have been more recently enacted. ESDC is needlessly obscure and lacks transparent accountability. To the extent it is accountable it is too much accountable only to the Governor and that involved questionable personal ties to the private developer himself. 1. “The City has carefully formulated an economic development plan that it believes will provide appreciable benefits to the community. .. .
2. “the City is endeavoring to coordinate a variety of commercial, residential, and recreational uses of land, . . . .
No, not in the case of Atlantic Yards. Government officials didn’t formulate a plan- A plan was formulated by the private developer (and not to benefit the community). Government officials were involved in coordinating nothing, they were involved only in deferring to the private developer who more often than not was the only one who really knew what was being done. Government officials did not invoke a state statute to authorize the use of eminent domain, a private developer did. The best that can be said is that Ratner had on his staff former government officials previously involved with eminent domain in their former positions and familiar enough with it to figure out how to stand the process on its head. Kelo was criticized because the constitutional standard of condemnation for “public use” became condemnation for `private use for anticipated public benefit.’ At least in Kelo the government was arguably in charge of the condemnation process. In the case of Atlantic Yards, however, the proposed condemnation is not only for private use (without truly discernable public benefit, even anticipated): this condemnation for private use is, in essence, being privately conducted by the entity seizing the benefit. It would be chilling to the utmost degree to even suggest that the US Supreme Court wouldn’t overturn the illegitimate Forest City Ratner Atlantic Yards process upon appeal. Elsewhere in the U.S. Kelo precipitated resounding cries for thoughtful reform and appropriate protection of private property, more respectful of the principles that concerned the nation’s founders. In New York Kelo was, in the mind of Bruce Ratner and the government officials willing to be complicit with him, the declaration of an open and free hunting season for those willing to abuse their fellow citizens exclusively for personal private gain. As a lawyer and as a former Attorney General, Governor Spitzer should know that the illegitimate Atlantic Yards procedures do not deserve to be upheld under Kelo. He also should know that even if such actions could ever be upheld as a matter of law they would not represent justice, just as they also do not represent good or transparent government. That is why people reform laws and why they sometimes simply refrain from indulging in opportunities for abuse. There are glimmering disavowals of this megadevelopment by our politicians, including particularly from Mayor Bloomberg (and once-upon-a-time Deputy Mayor Doctoroff) that recognize not only that the process here was bad, but that bad process led to bad result as well. City Council Speaker Christine Quinn has similarly, via her participation in an open letter to the MTA covering many parallels concerning Hudson Yards, embraced almost all of the important criticisms of Atlantic Yard’s abysmally blightful design. So much good will result when the project is finally killed and hundreds of millions of dollars are recovered by the City Council and State for uses that will be actually beneficial. In the case of Atlantic Yards, let’s let Bruce Ratner live in his fantasy land of unreality (where Frank Gehry is a native Brooklynite?). Let’s all the rest of us, the courts included, live with a real world of real facts where things are honesty regarded. It’s a reality we deserve to live in. Collection of Links: Noticing New York’s MDDW on Atlantic Yards and New York Eminent Domain Abuse. 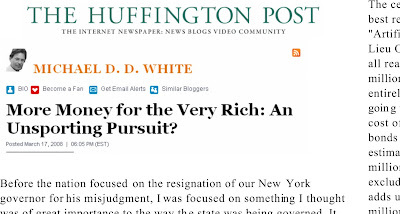 More Money for the Very Rich: An Unsporting Pursuit? The following is Noticing New York's written comment to the New York City Economic Development Corporation delivered in connection with its June 24, 2008 hearing on Proposed Coney Island Development. I offer this testimony as an attorney experienced in real estate and as an urban planner. I endorse the idea that New York should prepare for growth. Because I endorse that idea, I do not endorse this proposal for a vast reduction in the amount of amusement park space at Coney Island. Coney Island has an unparalleled history as a place of special and breathtaking amusement activities. It has changed, of course, from what it was but growing up I remember riding the horses at Steeplechase Park. Even then things were not what they had been and Steeplechase Park is a memory now. Things change and cities have their cycles. Only last week, Francis Morrone, historian and urban observer writing for the New York Sun wrote about the passing of the age of urban sprawl with what he refers to as the “unsprawling” of our cities. Whereas once there was what people referred to as an “urban crisis,” the term doesn’t get recognition in a world where our inner-city neighborhoods are no longer written off and instead command top dollar for homes as every neighborhood in the city becomes increasingly valuable. Clearly we must prepare for the City’s growth but would we prepare for and steward the City’s growth by decommissioning our city parks and having less public space? Certainly not! Does it then make sense to prepare for growth by decommissioning the happy, gaudy cousin of our other parks, the “amusement park?” In a time when centripetal forces are gathering population to the city, it is time to grow, not to shrink our amusement acreage. Our plans for growth must accommodate a city and Brooklyn that are surpassing themselves beyond what they ever were as centers of populations. Those populations must have the chance to play by the ocean-side in the open air. Shopping malls are not park or public space. Even if you call a shopping mall “amusement shopping” it does not make it an amusement park. To propose to reduce the amusement park acreas and then net out of the reduced space a shopping mall achieves nothing, lacks of forthrightness and is hardly a creative ruse. Coney Island has always been a place of imagination. Shopping malls are the bleak ideas of the imaginationless developer on their way to either a failure or an alternative project. Only a few years ago the public was opposing construction of the poorly conceived Albee Square Mall more recently rechristened the Gallery at Fulton Mall. Now? The ground lease was sold by Joe Sitt so it can be torn down and replaced by a high-rise housing, hotel, retail and office complex. Presently there is a proposal afoot to tear down the South Street Seaport mall built 25 years ago to enable development of towers. As we are now ostensibly ready to now to tear down the South Street Seaport which admittedly got some acclaim when it was built in 1983 we are, of course, now also talking about tearing down much sooner the significantly worse Atlantic Center which has been decried from the day it opened in Brooklyn the fall of 1996. Do developers’s now view malls as way-stations as they head toward hugely dense towers- Are malls now teh equivalent of the one-story `taxpayers’ that once preceded the shorter buildings of the past? If a shopping center flung far to the outskirts of seaside Brooklyn were a good idea wouldn’t our thirst for this commercialism be sufficiently slaked by the nearby Bensonhurst Park shopping center? I agree that one should pay attention to the economic interplay in terms of the highest and best use of land and the uses for which land becomes most valuable and for which the highest price will be paid. However, we must stop listening to the chant of developers long enough to remember that those rules do not apply when dealing with open space, parks and places for recreational amusement. Would we destroy Central Park because someone would pay substantial sums for its acres? No. And just like Central Park, the acres of Coney Island have special value because of their irreproducible location: Tied in with Coney Island’s history as the most desirable place to visit the sea, our mass transit infrastructure, belonging to us all, makes Coney forever accessible to all and sundry. Don’t dead-end this history. Why, at this location, would we want to replace the public’s amusement acres with private towers? Why when there are still other areas lying fallow and ready to be developed? These towers and malls do not need to be right where the amusement acres are. Nor do such towers need to be the most susceptible to the dangers of storm surge that they can possibly be. At the heights being talked about, for these towers they could be farther away and still the ocean views could be appreciated by their limited populace. If we are going to sacrifice amusement park acres to development, why sacrifice the most renowned and historic acres in the city? Once sacrificed there will be no going back. When you ascend the Wonder Wheel there will never again be a view of the ocean-side seascape offering a window and insight into a celebrated history. You will no longer see that panoramic side-by-side link between the beach and carefree seaside amusement. I brought my daughters over the years to Coney Island to ride the Wonder Wheel and the Cyclone, after which we always wanted more. Don’t give us less.